The Guitar Hero series is one of the most popular games on the Nintendo Wii. With the release of Guitar Hero World Tour, the entire band was invited to jam along with the guitarist. This created the need for a ton of Guitar Hero Nintendo Wii accessories. Some of them are extremely useful, while others are just for aesthetic purposes. In this post I want to run down some of the best in both categories. Having another guitar is one of the most useful accessories to have. Not all Wii guitar choices are equal, though. In order to get one that will stand up to the abuse that rocking out puts on it, you need one that is made by a reputable company. Activision is the company that makes the game and its guitars, so they are an obvious choice for extra ones. Their Les Paul wireless guitar is the most popular choice because of its rock and roll style, and durable construction. Logitech has been a leader is computer peripherals for a long time, and they also make wireless guitars for Wii. They cost a bit more than the Activision ones do, but they are the highest quality around and offer a more realistic feel than that standard plastic axe. Even though the game comes with stickers to decorate your axe, adding on a cover can put the hero’s guitar right in your hand. The most popular is the Van Halen guitar faceplate. It is a faceplate replacement that is a replica of Eddie Van Halen’s signature axe. Like the guitar faceplate, there are also protective skins available for the drum set. It’s hard to be nice to the drums in the middle of an awesome jam, so they take some serious abuse over time. Adding on these simple vinyl protective skins will help extend the life of your Guitar Hero drums. For the singer in your band, having a mic stand is an extremely helpful accessory. It works just like a traditional microphone stand, but is designed for the Guitar Hero mic. The most popular of all of these stands is made by Mad Catz, and it also holds the WiiMote to the side of the stand. 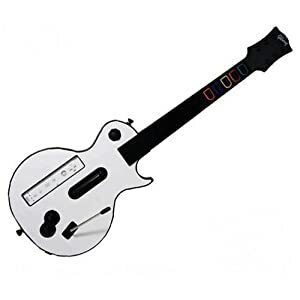 All of these Wii Guitar Hero accessories will help your band play better, look cooler, and have more fun while jamming. They aren’t the only ones, but they are some of the best around.